... In the early days of World War III, guerrillas - mostly children - placed the names of their lost upon this rock. Red Dawn is a 1984 American war film directed by John Milius and co-written by Milius and Kevin Reynolds. It stars Patrick Swayze, C. Thomas Howell, Lea Thompson, Charlie Sheen and Jennifer Grey. It was the first film to be released with the MPAA rating of PG-13. The film is set in an alternate 1980s in which the United States is invaded by the Soviet Union and its Cuban and Nicaraguan allies.However, the onset of World War III is in the background and not fully elaborated. The story follows a group of American high school students who resist the occupation with guerrilla warfare, calling themselves Wolverines, after their high school mascot. An introductory text explains how the USA gradually became strategically isolated when several European nations, except the United Kingdom, withdrew their membership in NATO. At the same time, the Warsaw Pact are aggressively expanding their sphere of influence. In addition, the Ukrainian wheat harvest fails and a communist coup occurs in Mexico. On a September morning in the small town of Calumet, Colorado, a local high school teacher pauses mid sentence when he sees paratroopers landing in a nearby field. These are Russian Airborne Troops, who promptly open fire when the teacher confronts them. Pandemonium follows as students flee amid heavy gunfire. In downtown Calumet, Cuban and Soviet troops are trying to impose order after a hasty occupation. Shortly thereafter, Colonel Bella (a Cuban officer) instructs the KGB to go to the local sporting goods store and obtain the records of the store's gun sales on the ATF's Form 4473, which includes the names of citizens who have purchased firearms. Jed Eckert, his brother Matt, and their friends Robert, Danny, Daryl, and Aardvark, flee into the wilderness after hastily equipping themselves at Robert's father's sporting goods store. While on the way to the mountains, they run into a Russian blockade, but are saved by a US Army helicopter gunship that destroys the blockade. After several weeks in the forest, they return to town; Jed and Matt learn that their father has been captured and is being held in a re-education camp. They visit the site and speak to him through the fence; Mr. Eckert orders his sons to abandon him, and to "avenge" his inevitable death. They then visit the Masons and learn that they are behind enemy lines in "Occupied America" (as opposed to Free America, the unoccupied zone) and that Robert's father has been executed because the guns from his store - the ones he gave to the boys - were found to be missing by the occupation authorities. The couple also charge the boys with taking care of their two granddaughters, Toni and Erica. After killing some Soviet soldiers in the woods, the youths begin an armed resistance against the occupation forces calling themselves "Wolverines" after their high school mascot. Initially the occupation forces try reprisal tactics, executing groups of civilians following every Wolverine attack, in hopes of intimidating the local population and compelling the Wolverines to surrender or desist from further attacks. During one of these executions the Eckert brothers' father is killed. Daryl's father, Calumet's Mayor Bates (who is a collaborator), tries to appease the occupation authorities. The teenagers find a downed United States Air Force F-15 pilot, Lt. Col. Andrew Tanner and learn about the current state of the war: several cities such as Washington, D.C., Kansas City, and Omaha have been obliterated, America's Strategic Air Command has been crippled in a surprise attack by Cuban saboteurs who had posed as immigrants illegally crossing the US-Mexico border, and the paratroopers the youths have encountered were dropped from fake commercial airliners to seize key positions in preparation for subsequent massive assaults via Mexico and Alaska. The middle third of the US has been taken over, but American counterattacks have halted Soviet progress and the lines have stabilized. Concerned about nuclear fallout, both sides refrain from the further use of nuclear weapons. Tanner then assists the Wolverines in organizing raids against the Soviets. Soon after, in a visit to the front line, Tanner and Aardvark are killed in a battle between a US and two Soviet tanks. As a result of the escalating attacks, Soviet commanders now view the Wolverines as a serious threat. Using threats of torture, KGB officers force Daryl to swallow a tracking device, then release him to rejoin the guerrillas. Spetsnaz are sent into the mountains following these signals, but are ambushed and killed by the Wolverines. The group discovers that their pursuers are carrying portable radio triangulation equipment and trace the source of the signal to their friend. Daryl confesses and pleads for mercy but is coldly executed by Robert, along with a Soviet soldier captured during the battle. The Wolverines' morale erodes as the war of attrition takes its toll. The remaining members are ambushed by three helicopter gunships after being baited by a truck dropping supplies on the road, and Robert and Toni are killed, leaving the group reduced to four. Determined to save at least some of their number, Jed and Matt attack the Soviet headquarters in Calumet to distract the troops while Danny and Erica escape to liberated territory. The plan works as Danny and Erica escape, while Jed and Matt are wounded. Though Colonel Bella encounters the brothers, he cannot bring himself to kill them and lets them go. 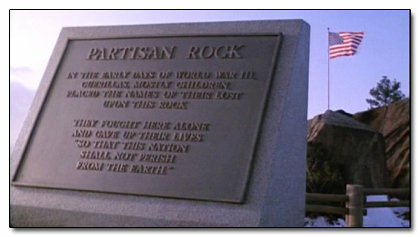 Still, it is implied that the brothers die in the park where the two spent time as kids. ...In the early days of World War III, guerrillas - mostly children - placed the names of their lost upon this rock. They fought here alone and gave up their lives, so that this nation shall not perish from the earth. Coming Soon. For more information, please contact us. © 2012-2018, PartisanRock.com.